The problems are: a) aquatic invasive species (AIS) hitchhike on boats and trailers and exploit new ecosystems where they are introduced, b) there is not a widespread appreciation that AIS are harmful, c) we have a culture and worldview that cannot adequately reconcile that easy and unimpeded access to and between lakes is exactly the pathway that AIS best exploit. Unless we are collectively willing to confront these problems, new invasive plants, animals and viruses will continue to infest and damage our lakes. Recent reports from Prior Lake show the explosion in zebra mussels, only one year after they were discovered. 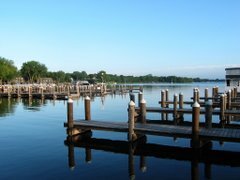 Zebra mussels in Prior Lake are encrusting docks, lifts and boats as well as clogging water irrigation and boat engine cooling intakes. We also expect impacts to the lake’s ecology. In another example, as Eurasian watermilfoil in Christmas Lake has increased, eight species of native plants have decreased. Once we recognize that AIS really are harmful, we must confront the reality that preventing their movement requires changes in behaviors, attitudes and values - a significant cultural shift in thinking and behaving. It is human nature to wish away a problem rather than to confront it. We lack clear leadership to recognize and confront the AIS problem facing our lakes. Even after lakes become infested, there is a tendency toward minimization, rationalization and denial. Last year, just after the discovery of zebra mussels in Prior Lake, I spoke with a homeowner to gauge their level of concern. They were not so concerned because they did not even see the zebra mussels in the lake - and they had been told that zebra mussels could even be fish food. Zebra mussels are certainly not fish food and unfortunately, we now know that zebra mussels are exploding in Prior Lake. I am afraid Lake Minnetonka faces the same fate. We must take the AIS threats seriously and take aggressive prevention actions if we value our lakes. We have become complacent, thinking that we are doing enough. Our protection system is largely permissive and a significant number of boaters are not even complying with current laws. The Minnesota DNR reports that extra efforts have occurred this year, especially at newly infested lakes. Intensive education, enforcement and inspections have logged 6,800 contacts at boat ramps and of these they issued over 320 warnings and about 120 citations – indicating that there is over 6% noncompliance with state laws, and that is with DNR uniformed personnel present. My personal observations on Lake Minnetonka indicate this rate of noncompliance is much higher, especially when inspectors are not present. A large number of boaters are indeed aware of and in compliance with our AIS laws – thank you. Unfortunately, given the millions of boater trips that occur between Minnesota lakes, even a small percentage of noncompliant boaters translates into a very large risk of moving AIS. We need even more funding, stronger laws, more enforcement and stiffer penalties. We need to take the AIS threat seriously. We also need to profile and prioritize are prevention program. As of this season, there are now four ‘superspreader’ lakes in Minnesota (Alexandria chain, Gull, Mille Lacs and Minnetonka) for zebra mussels. These lakes have (or soon will have) high densities of zebra mussels and large volumes of boat traffic. While increased protection efforts have occurred, they are unfortunately, still too small an effort. Fishing tournaments and tournament participants represent a high risk category. I do not think it is a coincidence that five of the six most recently infested zebra mussel lakes (Alexandria chain, Gull, Mille Lacs, Pelican and Minnetonka) are all in the highest prize category (greater than $10,000) of permitted fishing contests in Minnesota. These lakes are also very highly visited, but many other highly visited lakes do not have zebra mussel. I often hear criticisms of the MN DNR when the topic of protecting our lakes from AIS arises. In my experience, the DNR staff are professionals and are doing the best job possible with preventing AIS impacts, given the funding and policy constraints they must work within. We need to ask – no expect – our elected leaders to give the DNR more resources and clear policy direction to really protect our lakes.